So if you can see from above I’ve been meaning to write this a while ago. Anyway, I’ve been lacking on posting a whole bunch simply because my skin has been miserable. Like really bad to the point I was having elementary school flashbacks where I constantly had my oily bangs on my forehead and that caused my forehead to have all these little bumps. It was terrible! I have some photos I tried to take of them before I tried fixing them, but I really hated them and what’s worse is that I had no clue why they began! After a while (and lots of googling) I found out they were clogged pores. I knew they weren’t acne because I never have had an issue with it, plus all the acne products I tried did nothing. So I got myself some products with salicylic acid and micro-scrubs and went to town. It took months, I mean months to get it back to where it used to be and it still can get bad when I ignore my skin for too long since that oily skin still builds up and gets all gross. I’ve included some of the products that I’ve used to get it back to decent skin, and I’ll let you know what I still use and what is kind of my second string backup items. And no, I don’t use these every day, just as their results are needed, like if I use the Olay scrub, I won’t use Vasanti. Just a Post to Say, Buy the Simple Skincare Line! Hello all! 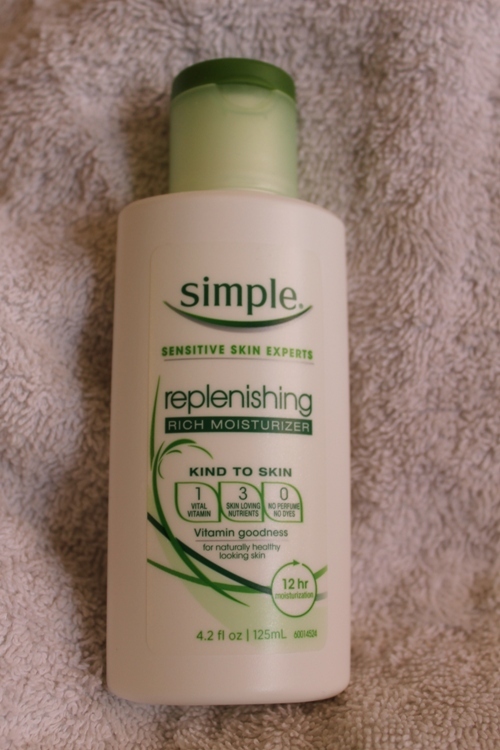 So not too long ago I posted a haul with the Simple Skincare line from Target, WalMart, etc. Below are some photos of me without the product and with it. Now the ‘before’ photo isn’t as bad as it normally is because I’ve been using this product so often. If you imagine a constant sunburn on my checks and forehead then you’ll see why this product is amazing!. Note: I also used the Simple Skincare Facial Wash in the shower as well. The photo with the towel is right after the shower, with nothing on. The one with my hair up is after the moisturizer is applied and dried. Click to see why this product rocks! Click to see the pictures!